Scuse typewriter, as my hand is not steady this morning. It would shake with rage, if nothing else, over our dear friend Mrs. Churchill. The only explanation I can think of of her extraordinary behavior is that she really is a bit touched, as some people have hinted. Of course she has no earthly right to take one single thing out of a house she has rented to some one, but equally of course we phave to be very careful about our own actions. No matter how outrageous she is -- and I have a feeling she will be more so before we are through with her -- we must keep the peace because of your mother. Any discussion of ways and means excites and distresses her; so we must go slow. 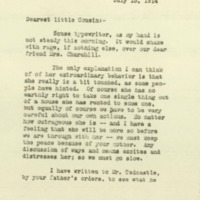 I have written to Mr. Tedcastle, by your father's orders, to see what he would suggest as to the best way of intimating to the lady that there is a limit to what she may take from Harlakenden. Until we hear from him your father thinks we had better do nothing and say less. It does seem to me, though, that Barbara might politely say that by mistake some of our own personal kitchen utensils have bee taken away with the things belonging to Mrs. Churchill. Meanwhile you had better buy at once what you actually need for the kitchen, as the Government furnishes nothing of the sort for the President's summer home and your father has to pay for them anyhow, whether they are bought here or there.Mrs. Jaffray will send up some more sheets at once. It is a shame that you have not been able to sleep on the porch!I don't know what to say about the rooms. It does seem as though your mother ought to have the front room, with your father in the room I had; but I don't know that she would want to change. If she did the Smiths could have the two rooms that your mother and father had last year and you and Frank could have your lod old room to dress in and sleep in on rainy nights and Margaret could have Nell's room. (She would not like this, but as she doesn't want her old room I don't see what else could be done.) Miss Harkins could have Margaret's old room. You and Margaret had better work it out, though, in any way that you think best, after we actually know that when we, down here, are to start for Cornish. I don't believe I had better ask your mother about the change of rooms till then, do you?There is one thing though that I shall ask as a great favor and that is that I be allowed to have one of the rooms ion the third floor. I willtakeitanyhow when I get there and I'd like to have the plans made accordingly. There isn't the least need of your going to the cottage, honey! Dr. Grayson is the one to go there, naturally, and you know it would distress your mother to have you so far away from her. As for the McAdoos, by the time they can join us, probably, the Smiths can be in one room. Cousin Lucy doesn't snore as much as she used to, anyhow. And I think it would make them uncomfortable to feel they would taking up more room than they needed.The Doctor will see about the horses at once and I'll let you know when they are to start. I believe the naughty sergeant is not to have charge of them this year and I suppose Davadge will live where he lived before. I'll find out where that is.Sweety, why on earth don't you have the little trap and, horse that Roberts let you have last year? * That is what Margaret will have to depend on (though she doesn't know it!) until the rest of the family go up. You see, the Government wouldn't pay for the expense transportation of the car and the expenses of the chauffeur unless they were sent up for the President's immediate family and your mother says as long as you have had to go without all this time there is no reason for sending a car up before they all are sent. (That sentence I consider a masterpiece; if you would like to have it autographed and framed so that you may keep it, send it back to me! )Both our invalids are getting along all right. The Boss shows no disposition to change her mind about Cornish, though. Bones, Helen Woodrow, “Helen Woodrow Bones to Jessie Woodrow Wilson Sayre,” 1914 July 15, WWP17494, Jessie Wilson Sayre Correspondence, Woodrow Wilson Presidential Library & Museum, Staunton, Virginia.